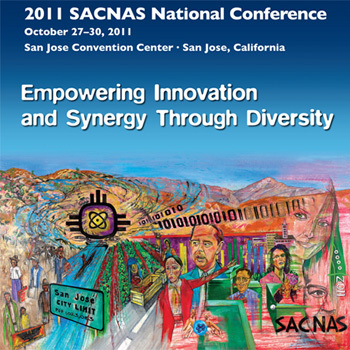 An estimated 3800 students and scientists will attend the 2011 SACNAS National Conference to be held October 27-30 in San Jose. As a major sponsor of the event, UC Santa Cruz will be hosting a reception at the Tech Museum on October 26 and a field trip on October 27, bringing a group of conference attendees to campus for faculty presentations and a tour of research labs. SACNAS (the Society for the Advancement of Chicanos and Native Americans in Science) is a nonprofit organization dedicated to advancing Hispanics/Chicanos and Native Americans in the "STEM" fields: science, technology, engineering, and mathematics. Frank Talamantes, Clifton Poodry, and other UCSC faculty helped found SACNAS in the early 1970s, and the organization still has its headquarters in Santa Cruz. As in past years, a sizable contingent of undergraduates and graduate students from UC Santa Cruz will attend the 2011 national conference to present their research in the scientific sessions. "We have always sent a lot of students to SACNAS conferences. It is a sign of the campus's longstanding commitment to supporting underrepresented students in the STEM fields," said Tyrus Miller, vice provost and dean of graduate studies at UCSC. The SACNAS conference provides a valuable opportunity for students to give research presentations and receive feedback and guidance from volunteer mentors and judges who are all doctoral-level professional scientists. Sponsoring institutions play a critical role by providing faculty and researchers to serve as mentors and judges. The conference also offers networking opportunities, faculty presentations, and professional development workshops. "It's a good place for students who are interested in graduate school to talk to faculty and learn about graduate programs. It gives them a step up in applying to graduate schools," said Malika Bell, director of STEM Diversity Programs at UCSC. Most of the UCSC students who attend the SACNAS conference are involved in one of the programs Bell oversees, such as the Initiative for Maximizing Student Development (IMSD), Minority Access to Research Careers (MARC), California Alliance for Minority Participation (CAMP), and UC LEADS. More information about the SACNAS National Conference is available online at sacnas.org.